I never tried Aqua Mineral but I always see it at Trinoma. I am curious to try it that is why I joined Ms. Cheryl's (http://healthfrontiersandmore.blogspot.com/) give away as soon as I saw it. Fortunately, I won a gift certificate for a Nail Kit. I just claimed it last month. I let my hands have nail polish applied so I could test the Nail Care Kit. I left the polish on my nails for 3 days to let it stain my nails. Let me now share my product review. 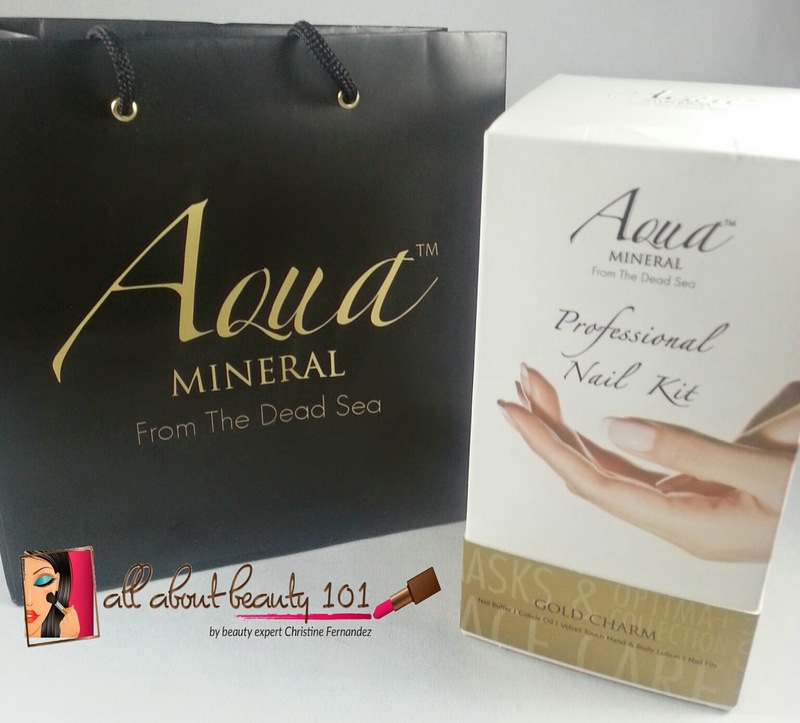 Product Description: Use Aqua Mineral's Professional Nail Kit just once and you will be thrilled with your shiny, healthy-looking nails. The Professional Nail Kit will free you from dependence on professional care for your nails while saving time and money. 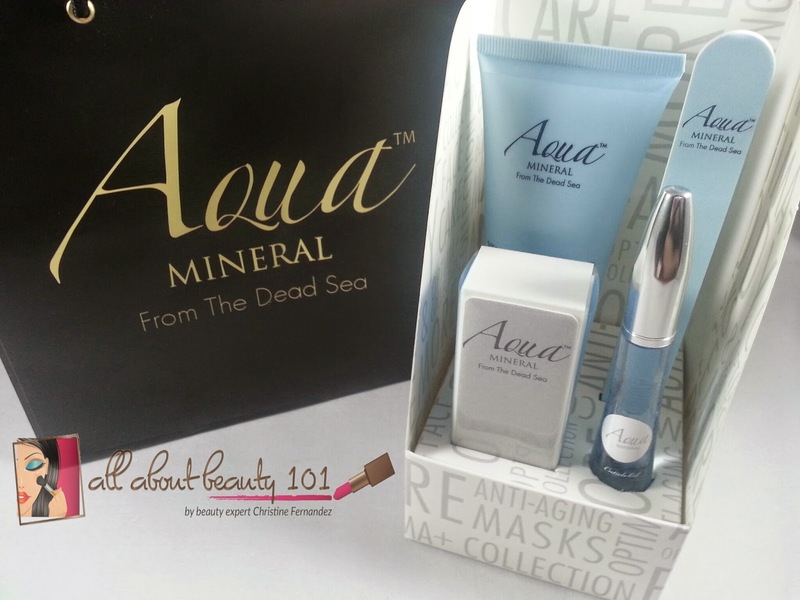 Aqua Mineral is a complete beauty skincare line created to help slow down your skin's aging process and maximize its wellbeing. Based on wonderworking Dead Sea minerals, Aqua Mineral skincare products far outperform traditional skincare solutions. Dead Sea salts and minerals, found at the lowest point on earth, are famous for their remarkable health and beauty benefits. All Aqua Mineral products are Paraben-free and contain no Sodium Lauryl Sulfate. I followed the directions on the packaging to remove first all my nail varnish and then wash and dry my hands and nails thoroughly. I proceed to the use of nail file to shape my nails. After that, I used the nail buffer to remove stains, smoothen it and make my nails shiny. The nail buffer has 4 sides. two blues, one grey and one white. The Blue side is the first step and the nails should be buffed for 5-10 seconds once a month to remove surface ripples, ridges and stains. The Grey side is for smoothening, buff the nails for 5-10 seconds once a month to smooth the nail surface and stimulate growth. The white side should be used for another buffing of 5-10 seconds to give the nails shiny look. It can be used as needed or every 2 weeks. The next step is to apply this cuticle oil around each of my nails and skin then massage it until fully absorbed. The packaging said this is to prevent splitting and dehydration. The cuticle oil was fully absorbed at least after 30 minutes without massaging. I tried massaging it but it seems I am just removing the oil instead. After it was fully absorbed, the shine on my nails disappeared but it feels smooth. It was declared that it is a dead sea nail treatment so it is not just an ordinary cuticle oil. Ingredients of Cuticle Oil: Paraffinum, Liquidum, Canola Oil, Helianthus Annuus (Sunflower) Seed Oil, Vitis Vinifera (Grape) Seed Oil, Simmondsia Chinensis (Jojoba) Seed Oil, Isopropyl Myristate, Tocopheryl Acetate, Borago Officinalis (Borage) Seed Oil, Dead Sea Salt (From the Dead Sea). May contain FD & C Blue #1, FD & C Red #4, FD & C Yellow #10, D & C Brown #1. I did not re-applied a new nail polish on my nails so I did the next step and which is to apply the hand and body lotion. I just applied it on my hands up to my wrist. The hand and body lotion weighs 125ml and it will last long as it is easy to spread on skin with just little amount. The hand lotion moisturized my hands and it felt soft. I tried washing my hands and the moisture is still there. However I am not that happy with the scent, it is too strong for me. I also do not like that the greasiness on my hands as it transfers to other things such as my laptop's keyboard while I was reviewing this product. The tube is tightly sealed. I had to puncture the seal to completely open it. It seems the plastic was not removed together with the silver lining. My skin and nails after application of cuticle oil and hand lotion. The whole treatment helped in removing my dry skin around my cuticles and it remained that way after it was fully absorbed. The shiny part on my nails disappeared after the cuticle oil was fully absorbed. I liked that this package helps us be independent on taking care of our skin and nails but the price of the package is not affordable for maintenance at home.